It’s been a long time coming. His influence was undeniable, and his music was as “country” as “country” gets. Second to only Elvis Presley in total album sales, Garth Brooks is more than just an artist. 12 years have passed since his announced retirement from the music industry, and aside from a slate of shows at the Wynn theater in Las Vegas, Garth has honored that announcement. However, the “sevens have alined,” and he has all but announced his return to the vocal world. This story is newsworthy. Above the “Miley,” beyond the “Gaga,” Garth is simply Garth. He’s the finest of wines that gets better with age. The demand for his concerts once resulted in sold out shows within minutes. There wasn’t enough Garth to go around. Now that he’s given fans time to remember what they’ve missed, you can only imagine the excitement in hearing of his return. Entertainment Weekly is a pretty high-profile media outlet to completely whiff on any sort of comment from Garth or any of his representation. Even the simplest quotes can add life to an article, and they were sorely missed here. I was also shocked that there were no links to any of Garth’s music or performances. If you’re going to talk about the greatest country artist to ever live, then you should probably show your audience why he’s the greatest through a couple examples. Just as the whispers of a return echoed throughout Diagon Alley, they now slither their way through the country music world. “You know who” is back. Tyler Kacmarynski dims the lights. The Red Hot Chili Peppers’ “Other Side” bellows from a beaten down stereo system hanging from a western wall. A glimmer of light reflects off the sweat stained wrestling mat at Spencer High School in the small Midwest town of Spencer, Iowa. That very familiar shadow races across the floor from wall-to-wall, slapping the wall with the completion each lap. Thanksgiving is a time of rest and relaxation for most college students. A time to go home, lie on the couch, and soak in a few football games while munching on some homemade family favorites. For Kac, as he’s commonly known, however, it’s a chance to get an advantage on the competition. That’s exactly why he’s back where his competitive roots began. He signed his letter of intent to wrestle at Morningside College in 2009, and has been chasing one goal ever since. Injury has not stood in the way of his life-long passion. He’s endured two ACL surgeries, a repaired meniscus, and a Tommy John operation on his right elbow. The recovery process from each surgery was frustrating in its own way. Kacmarynski explained the hardest part about the ACL surgery was staying patient. The recovery process was long; months of holding back, and slowly but steadily finding solid ground for shaky legs, and waiting for the day he could step foot back on the mat. Injuries are common in wrestling due to the physical demands, but those same physical needs are exactly why Kacmarynski says he loves the sport so much. The dawn is rising on a new season for Kacmarynski and the Morningside Mustangs. In his final season, Kacmarynski is looking to make some noise and go out with a bang. After this season, and this academic year, Kacmarynski looks forward to continuing his career on the mat as a coach. “I want to coach. I don’t know where, and I don’t know at what level. I just know I want to be around wrestling for the rest of my life,” he stated. The future can wait. For now, Kacmarynski is living in the present, and looking forward to every single match. 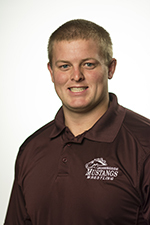 The Morningside Mustangs wrestling team begins their 2013 dual season on Friday, November 15th at 3pm. Joining the Mustangs in Sioux Falls are the Air Force Falcons and the Augustana Vikings. While both teams present an impressive challenge, several of the Morningside grapplers are looking forward to the duals. The Mustangs will get a true test of their Horsepower on Friday. A recent string of college shootings has raised a question of student safety on campuses around the United States. The most recent incident took place at Brashear High School in Pittsburgh, Pensylvania. Other notable incidents include the Virginia Tech shooting in 2007, and the imfamous Columbine shootings in Colorado. Trust and support are also important in the struggle against school violence. It’s that time of year again. The noses are running, and the hallways are filled with sniffles. Rest is important, and so is staying hydrated. Be sure to drink plenty of fluids. This may be the one time of year that students actually get eight hours of sleep. After taking a look at the celebrity profile of Jason Aldean on aceshowbiz.com, I couldn’t help but notice the All-American image the profile portrayed. Aldean, or Jason Aldine Williams, is a Georgia native who had to go through several trial-and-error attempts before making his own musical breakthrough. Having read up on and heard Aldean’s story before, I was already familiar with his background. I liked how the profile walked through each progression in his musical journey. As a fan, his story makes me proud of him for sticking it out through each trial and tribulation. As an artist, his story gives me hope that with perseverance, there is a chance for anyone who wants it bad enough. The biography itself only featured one photograph, but there was a link to a gallery that had pictures from all occasions from on-stage to award shows. Overall, I feel that the profile did an outstanding job of featuring who Aldean is an artist, and the journey he took to get there. It did leave the majority of his family life out of the writing. I completely appreciated that, as I was looking for information on him and not his wife and children. Imagine a world where Walt Disney’s cheerful creations melt away into a world of ghouls and utter darkness. Welcome to director Randy Moore’s mind. Now imagine trying to shoot an entire film within the Disneyland and Disney World gates without permission. Seems improbable, if not impossible, but it has been done. The director flooded the Orlando and Anaheim parks with his cast and crew, and managed to do so without any serious legal repercussion as of yet. The article featured below caught my attention due to the fact that it focused on a major piece of my childhood. The fact that he was able to accomplish the filming of an entire movie also amazed me. The article was relatively well written, but since the movie has been released and featured in a film festival, I feel like it should have included a clip from the film. I did like how it felt like I was listening in on a conversation between the subject and the journalist. There isn’t much a would have changed about this article. I will say this much: I would definitely go see this movie after reading this. This article was newsworthy simply because it defies the norm. It shines a bright spotlight upon the bold changes certain organizations are making. The freedom of an employee to express their personality is a brilliant way to gain the respect and appreciation of customers. All-in-all, this article was incredibly well-written. It featured links to the entire “Captain Mike” customer service conversation with the customer, as well as a video explaining the Netflix culture. There were several quotes from a former customer service worker. The most important thing for me, however, was that it captured my attention from start to finish. Read it. You won’t regret it. After finally settling in at home in Library room 111, several Morningside students are moving to a new classroom. Due to renovation and construction on campus, several classes will be moving. The Morningside College web page describes the new location as a “State of the Art Smart Classroom” in Roadman Hall. Despite the name, the setting isn’t exactly “State of the Art,” however. The room features several 2000 dates on the equipment, and houses multiple box-television sets. Several students were asked how they felt about the situation. “I think it’s going to be really hard, because I don’t know if I’ll remember to go there every day,” sophomore Jordan Truckenmiller scoffed. For most students, simply remembering to go to the right room seems to be the biggest challenge. For Audio Version: Change of Scenery? The honeymoon is over for Richard and Laurette Brunson. The two were married around 2pm yesterday afternoon. Shortly following an incident at the reception, shots were fired, and Mrs. Brunson found herself in the hospital. The shooter was none other than Mr. Brunson himself. Their neighbor, Walter Corse, described the panic at the scene. Following the shot, Richard Brunson was nowhere to be found. Police are still in search of the 50 year-old suspect. When Darrelle Revis signed with the Tampa Bay Buccaneers in the 2013 off-season, several NFL fans, including myself, expected great things. Along with the Revis signing, the Bucs also snagged free-agent safety Dashon Goldson. Essentially, two the most highly touted defensive backs in the league headed to Tampa. The issue, however, is that the coaching staff hasn’t necessarily played to the strengths of their newly acquired stars. Revis, who had earned the nickname “Revis Island” for his ridiculous shutdown skills in man coverage, has been delegated nothing more than a place holder in a zone scheme. This has made some fans mad. Really mad. Several of them showed up at the Buc’s practice facility, more than willing to demonstrate to the coaching staff how to use Revis and his skill-set. This article, in all honestly, is a few weeks late in my opinion. A secondary with insane talent finds itself shredded at the end of every Sunday. All the talent on the field means nothing if the coaches don’t put them in position to make plays. The author made several solid points, and the fact that fans actually showed up at the facility cracked me up. I thought it was well written, and the only thing missing was a couple quotes from Revis, himself. The featured video tied in nicely, and basically, if the Buccaneers don’t start winning games, Revis will be under new management anyway. Diamonds Found on Other Planets? Diamonds are believed to form on planets other than Earth. According to CNN sources, researchers believe that diamonds may in fact be present on Saturn, Jupiter, Neptune, and Uranus. The combination of atmospheric pressure and temperature are perfect for hosting the treasures. There is no hard proof, of course. There are no diamonds in hand. However, the chemistry does match the thought process. In 1981, Marvin Ross pointed to the levels of methane on Uranus and Neptune. Those levels, combined with the temperature and pressure would allow carbon to form a diamond. Valentine’s Day is coming fast, and for most of you, a trip to Saturn won’t be in the cards. Take it from me: go to Jared.